I once wrote that it’s rare for a restaurant to relocate inwards from the suburbs to the centre of town, rather than other way around. Recent events are proving me wrong, showing that such a move (or sprouting a second branch closer to the centre of town) is indeed possible. With the right confluence of well-connected proprietors, a track record of success, well-heeled investors and a catchy ‘concept’, a London restaurant can indeed secure the prime real estate that had eluded it before. That’s the trick the people behind Pidgin have managed to pull off with Magpie, their second restaurant. Elizabeth Haigh (née Allen), Pidgin’s former head chef whose talent helped that restaurant win a Michelin star, isn’t involved in Magpie but that hasn’t blunted Magpie’s ambition. Although a handful of dishes are on a menu and prepared to order, the majority of Magpie’s eclectic fare is pre-prepared and then literally carted around on heavy, medieval-looking trolleys and trays Dim Sum-style for you to choose from as and when you want. All of this occurs in a big, airy dining room in Mayfair which is at least four times the size of Pidgin’s far cosier back-street Hackney digs. 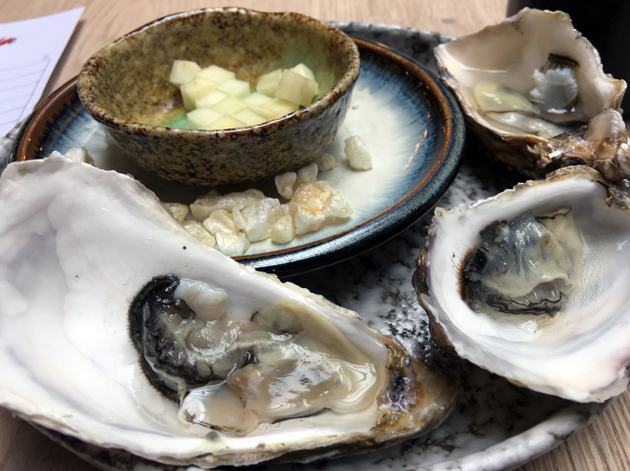 It wasn’t native oyster season during my first meal at Magpie, but the oysters on offer were nonetheless surprisingly good. 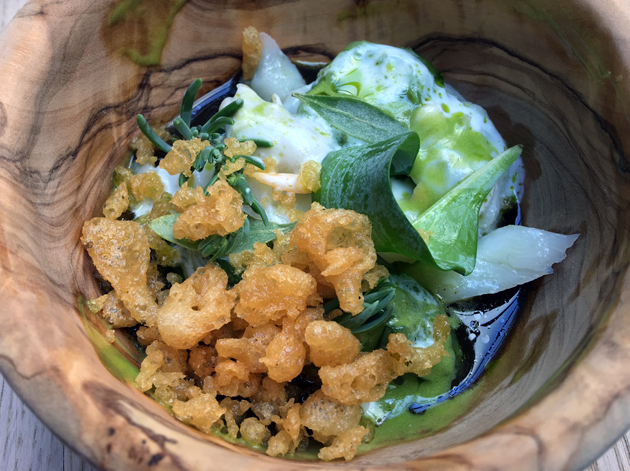 The natural sweetness of the slim little molluscs was enhanced by a dash of vinegar and some cubed apple, but the pork chicharrons were neither here nor there. When the world was at war, we kept dancing. A chunk of firm and smooth celeriac tasted quite neutral and thus needed something more characterful than the tame and timid sauces that accompanied it. All this left the tartness of the pickled watermelon rather purposeless. 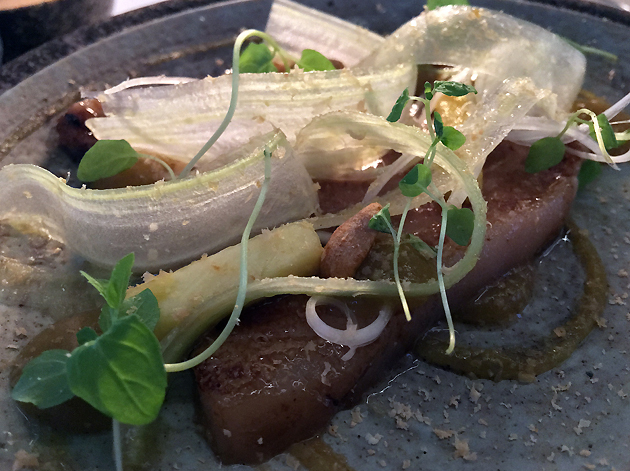 As pleasing as the fruit was, its qualities were hardly needed given the generally lacklustre barbecued celeriac. Magpie’s selection of beetroot wasn’t the best I’ve ever had, but it was nonetheless respectable in its variety of flavours which ranged from the pungently earthy to the gently sweet. Pleasing, but this should be easy to beet. 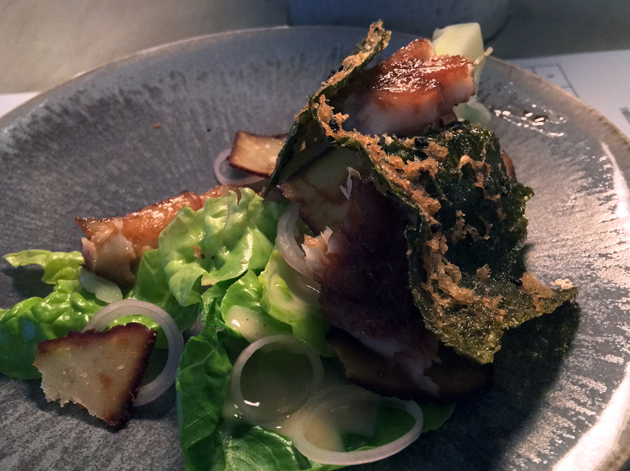 A dense and fleshy hunk of cod came topped with crunchy, tempura-ish flakes of batter. I couldn’t detect the presence of the promised pickled cockles, leaving it to the mildly aromatic lovage and sweet cucumbers to pick up the slack. Although these accoutrements did manage to bring some joy to this dish, it was all too little and too late. 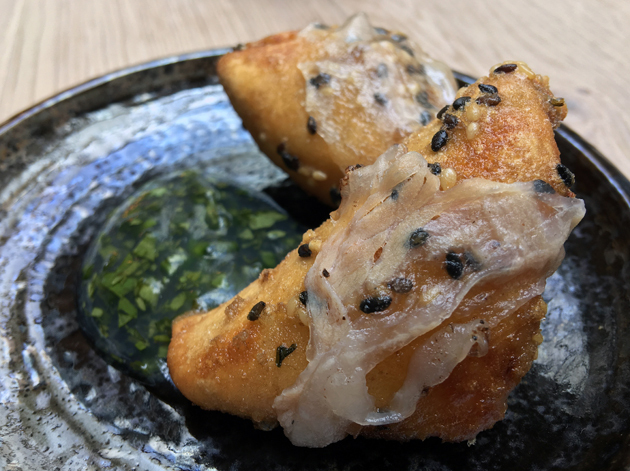 Prawn ‘toast’ had been inverted in Magpie’s reimagining, with the toast taking the form of an inari-like coating around a ball of minced prawn. Unfortunately, the unpleasantly tough chewiness of the coating and the insipidness of the prawn both left much to be desired. When the most successful part of a dish is the nutty dash of sesame, then something has gone horribly awry. Dear London restaurants. Please stop reinventing prawn toast. It was horrible to begin with. Kthxbye. Meaty strips of turbot had a clean aftertaste, which made it a surprisingly good partner for the sharp sweetness of blackberries and the tang of cabbage. 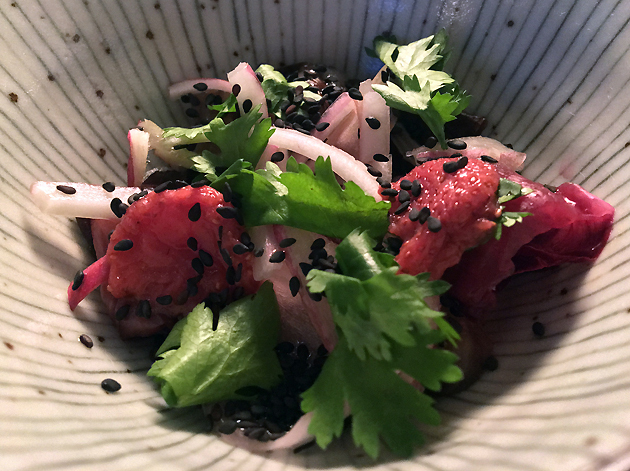 It may not have been a traditional crudo, but it was a damn fine one nonetheless. 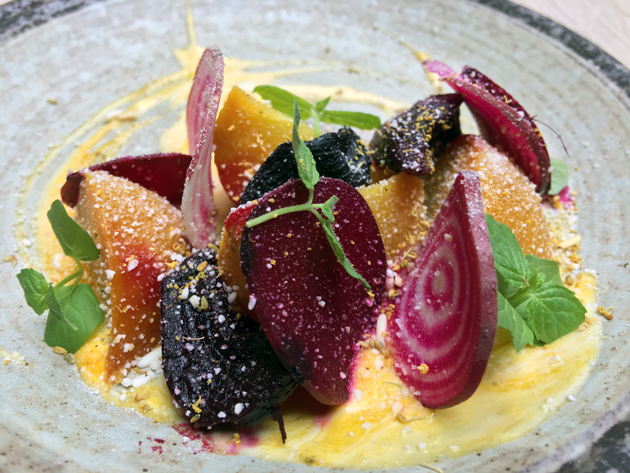 The food at Magpie is nothing if not visually attractive. ‘Shabu shabu’ beef was impressive in its meaty creaminess, qualities that contrasted neatly with the sharpness and sweetness of pickled daikon. It’s one of the most impressive beef dishes I’ve had in London this year, thus far. Yes, this is a beef dish. And a bloody good one at that. 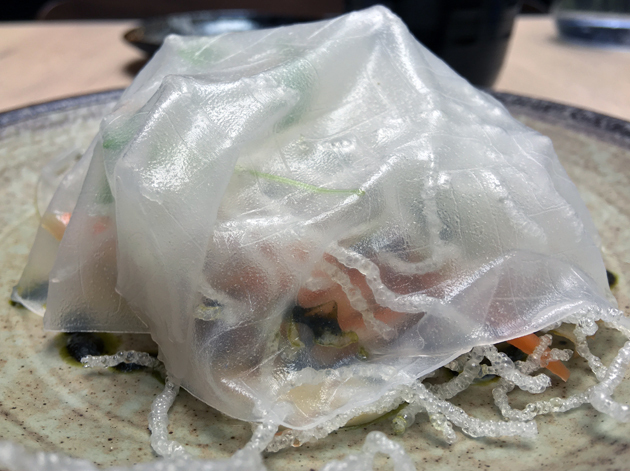 ‘Rice paper’ doesn’t sound very appetising, but it’s a close relation to the dumpling skins and sheets of cheung fun noodles that one would find in actual Dim Sum. 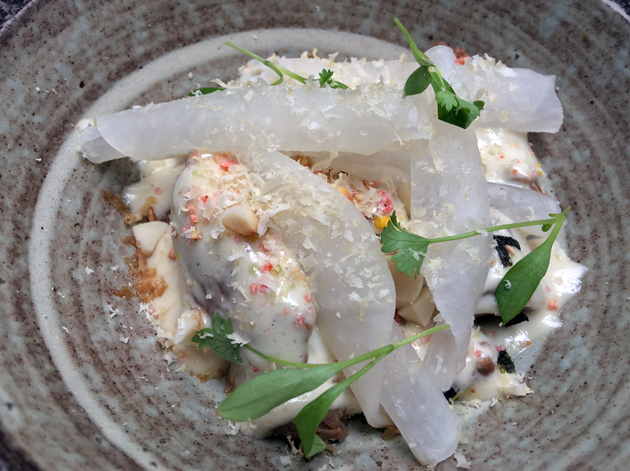 Its role here was largely just for looks, but its ‘filling’ really hit the spot – a selection of tart and vinegary pickled carrots and daikon, along with crunchy fried rice noodle bits, all dressed in powerfully umami and smoky sauces. It may have been somewhat unconventional, but this was still an overwhelmingly pleasing dish. The ‘yoghurt panna cotta’ resembled doi, the Indian fermented yoghurt dessert done especially well at the nearby Kricket. It wasn’t quite as multilayered as the comparable dessert at Kricket, but its sweet and caramelish milkiness was nonetheless winsome. 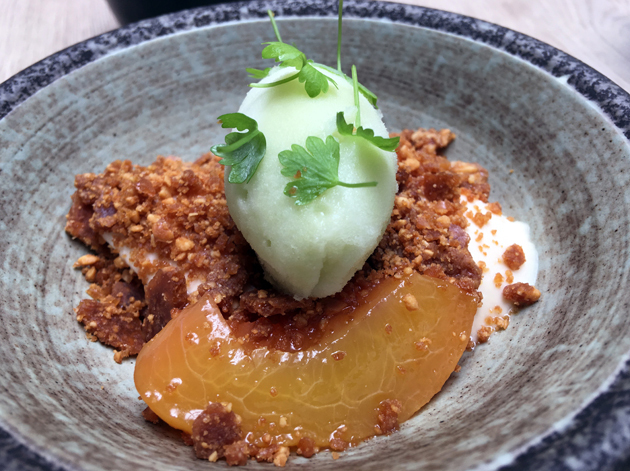 The unexpected tartness of the peaches and the crunchy peanuts were surprisingly complimentary – with each other and with the panna cotta. All of this would have been more than enough on its own, but the sorbet elevated this dessert even further. Crisp yet smooth, the sorbet also had the unmistakable peppery sharpness of celery. All of this not only made it flavoursome, but an excellent palate cleanser to boot. I really should’ve left it there, but I couldn’t help but indulge in a second dessert. 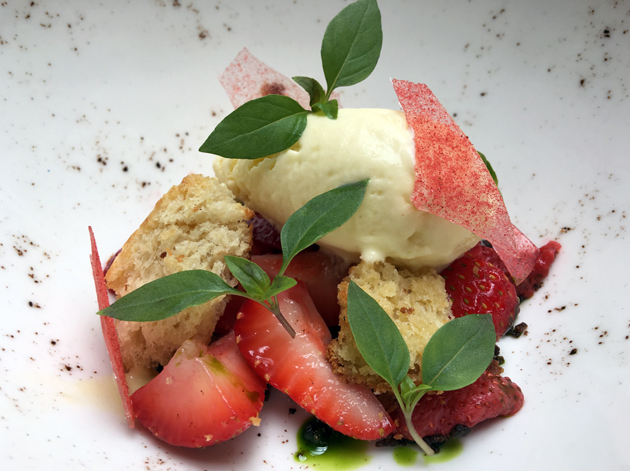 The strawberry panzanella would’ve been better off without the stodgy, stale-tasting bread pieces. Although they hark back to the traditional savoury panzanellas on which this dessert is based, their presence just served to distract from everything else. Sweet strawberries with a sharp and herby lovage-like dressing contrasted well with the slightly bitter and crunchy breadcrumbs. What is it with Pidgin’s and Magpie’s panzanella obsession? 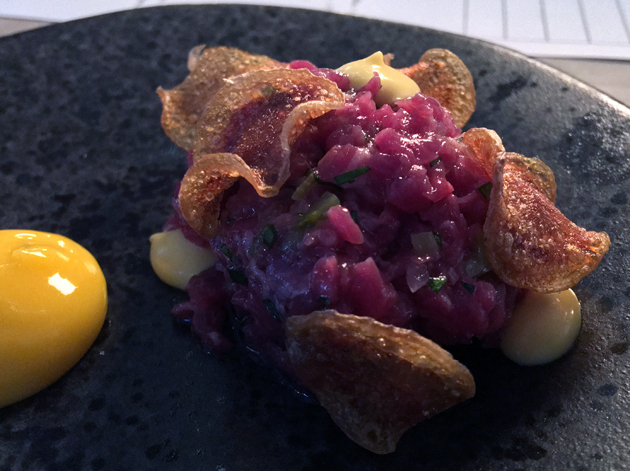 Given the superlative nature of the ‘shabu shabu’ beef, the steak tartare was a comparative let down. 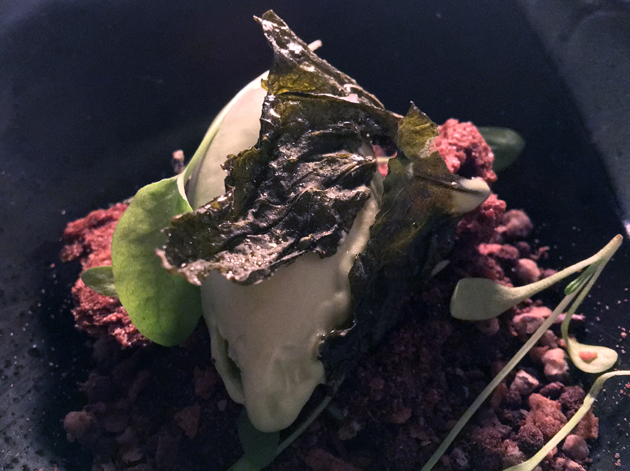 Only relatively speaking though – on its own terms, the quivering and modestly chewy raw beef was still a distinct pleasure to sink my teeth into. With a dollop of smokiness and an eggy, unctuous cream in the mix, it had more than enough charm to stay in my good books. Not a traditional steak tartare, but that doesn’t matter when it’s *this* good. Similar flavour profiles repeated themselves in the tomatoes. 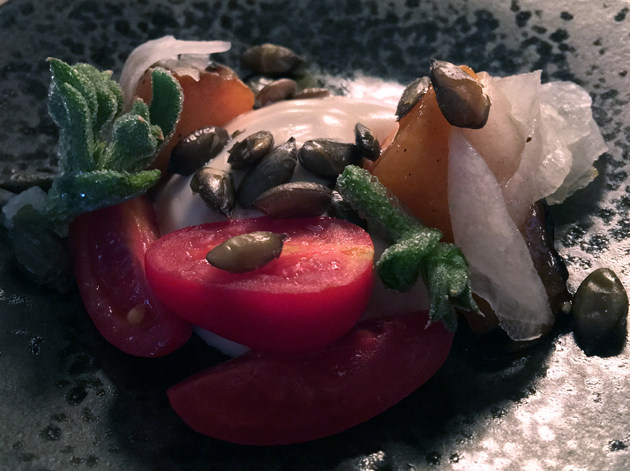 The fruit slices themselves were largely sharp and umami, but a smoky cream, tart radishes, nutty pumpkin seeds and a herby garnish were not only flavoursome in their own right but also complimented the tomatoes rather than clashing with them. Magpie’s odd reservations policy means it only accepts bookings in the evenings for groups of four or more. 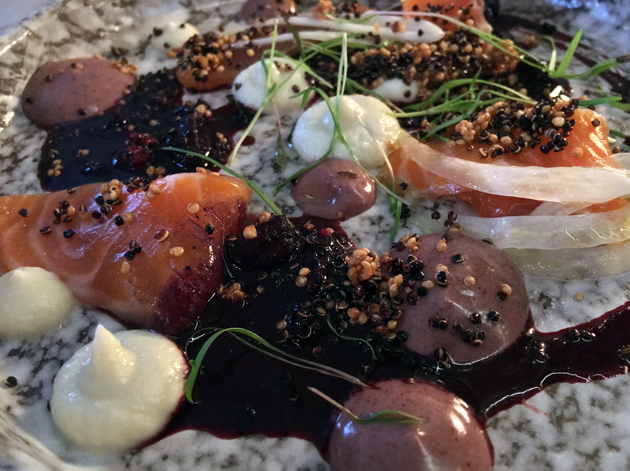 The fish crudo with blackberries from my first meal made a return appearance, but with a rather lacklustre salmon in place of the turbot. If there was ever an example of a dish that can become dramatically less sumptuous when a superlative ingredient is replaced by a second rate substitution, then it’s this one. Which means lone wolves and couples have a higher chance of being seated at the bar on busy evenings. Pork shoulder and belly were almost lardo-like in their soft and pliable fattiness. The gentle porkiness of the swine flesh received an unexpected boost from the sweet, tart and silky soft shavings of radish. The versatility of pork never ceases to amaze. Which would be fine, except the oddly triangular bar stools can be brutally uncomfortable. Depending on the particulars of your unmentionables. By which I mean gonads. 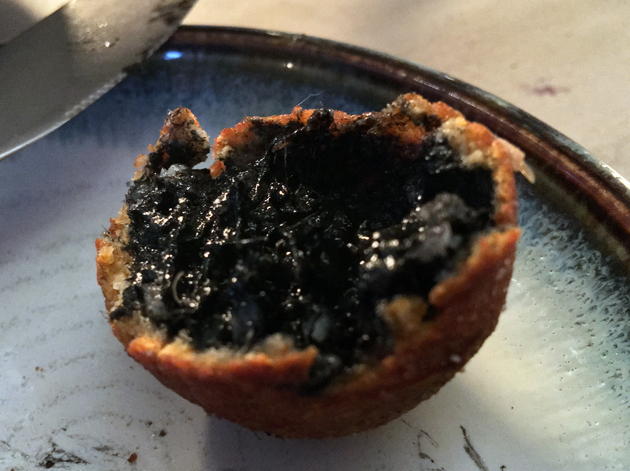 Arancini were crisp and oil-free on the outside, blackened with squid ink on the inside. The earthy cheesy funk of the inky black mushroom filling was strong enough to stand out against the tingly heat of the sriracha-esque spiced mayo on the side. Almost as dark as my soul. The ‘Japanese’ Caesar salad was only Japanese in its use of an out-of-place nori as far as I could tell. At least it wasn’t as ineffectual as the smoked eel which struggled to shrug off its resemblance to a supermarket-level smoked mackerel. Without the lacquer-like glazed skin of a true Japanese-style cooked eel, this salad was just a heap of so-so fish with equally uninspiring lettuce and parmesan. Wouldn’t a ‘Japanese Caesar’ salad nominally be, I dunno, a Tokugawa salad? Magpie’s kitchen clearly likes playing around with ingredients, taking them out of their usual contexts. A pickled strawberry salad was meant as a savoury dish rather than as a dessert. Regardless, it was highly unbalanced – the tangy sharpness of the pickled fruit was almost boozy in its overpowering stench and strength. Like a tanked-up Millwall fan, it barrelled over the other wilting inhabitants of this bowl leaving nothing behind but the taste of regret. I could have started this review with something about how the name ‘Magpie’ seems to be linked to the pick-and-choose ‘Dim Sum’ trolley concept. But that would be dull, predictable and lazy. 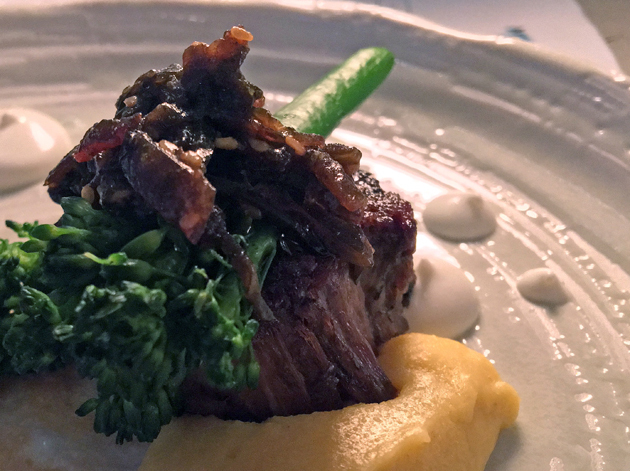 An earthy, sinewy chunk of lamb neck, with some segments still attached to bone, crowned a nutty, creamy and grainy head of polenta. The broccoli was neither here nor there, but that didn’t matter. An umami dressing and a puree that somehow managed to remind me of both sesame and prunes both helped elevate the meat-grain combo to new heights. Labneh-like squirts of yoghurt refreshed the palate in preparation for the desserts to come. One of the non-trolley cooked-to-order dishes. The bits of stale bread from the strawberry panzanella made an unwelcome repeat appearance, this time as the un-needed chaperone for darkly bittersweet bits of chocolate. Bread or not, the chocolate never become overwhelming or heavy thanks to the unusual ice cream. Almost vegetal in taste, this unusual but pleasing element was accompanied by tangy and bitter elements that were almost citrus-like and just as refreshing. A chocolate dessert that isn’t predictable or boring. That alone deserves accolades. Curled sheafs of gently musky and earthy cheese were more than good enough on their own. 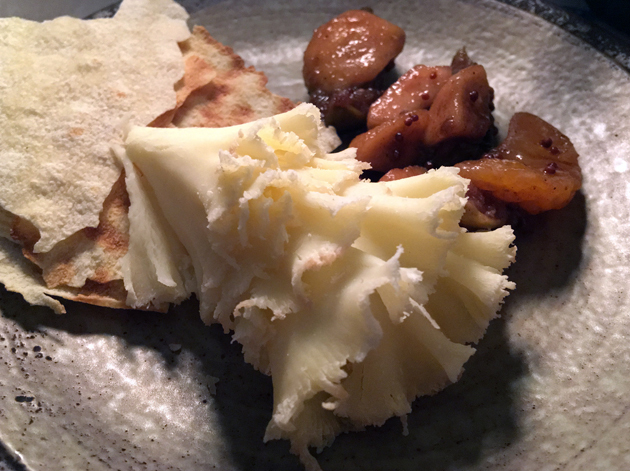 They didn’t need the milky crackers or sweet and tart kumquat-like fruit chutney, although these accompaniments were pleasing in their own right. The crockery at Magpie is rather lovely. Magpie’s kitchen is clearly capable of some delicious, convention-defying cooking. But its output was also surprisingly uneven, with quite a few eyebrow raisers amongst all the winners. 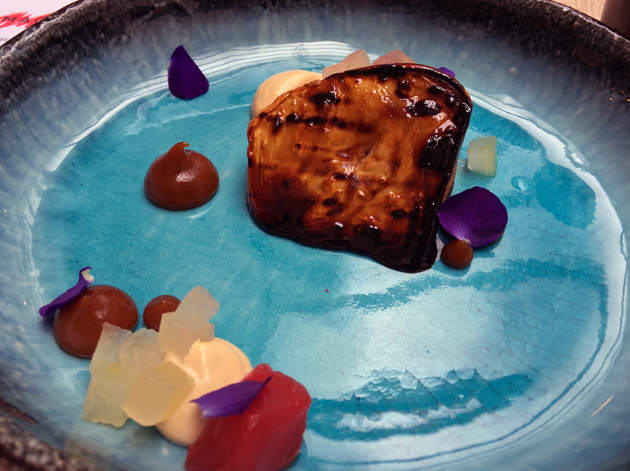 There was also some repetition with smoky, pickled, creamy and tart flavours seemingly making constant reappearances. Of course, Magpie’s cooking is inextricably tied to its ‘Dim Sum’ concept. With no heaters on the trolleys, most of the dishes are light and designed to be served at room temperature (or tepid if you’re a glass half-empty type). 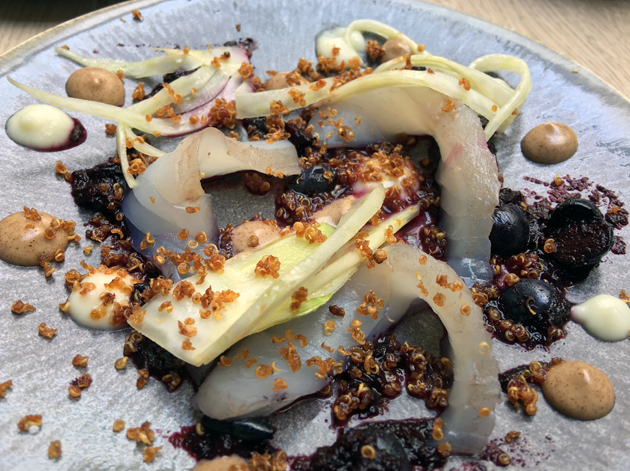 While this is welcome in the balmy summer months, it remains to be seen how Magpie’s dishes will evolve given that most people want to be cosseted in warmth when the cold nights of autumn and winter arrive. While the highlights at Magpie have mollified some of my scepticism towards the whole trolley malarky, it hasn’t been wholly extinguished. At best, this trolleying about allows you to sample a wide range of dishes. You can eat as much or as little you want, all at your own pace, with this rough DIY version of a haute tasting menu. Unpopular dishes should eventually fall by the wayside as the kitchen takes note of dishes that return unwanted. At worst, it encourages just-one-more-dish overspending with nothing but my words and your own intuition to help you separate the wheat from the chaff. I like Magpie, I really do. It’s worth eating here as long as you keep your wits about you. But I can’t help but suspect it’d be a much better restaurant with a traditional menu instead of having these clunky trolleys rolling around. Opening Hours: Tuesday-Sunday noon – 14.30 and 17.30-22.30. Closed Mondays. Reservations: essential. In the evening, reservations are only accepted for groups of 4-6 people. Average cost for one, including service charge but excluding soft drinks: £70 approx. Tags: arancini, beef, beetroot, blackberries, caesar salad, celeriac, cheese, chocolate, cod, eel, gelato, lamb, london, magpie, mayfair, mayonnaise, oysters, panna cotta, panzanella, pickles, pidgin, polenta, pork, prawns, raw, restaurant, review, salad, salmon, sorbet, steak tartare, strawberries, tempura, tomatoes, turbot, yoghurt. Bookmark the permalink.